In New York City this Easter weekend and looking for fun with beacons? It’s not too late to celebrate the season (and the kid/tech nerd in you) with THE BEST EASTER EGG HUNT EVER. But hurry! The hunt ends April 26th. Lola is currently leading the Footmarks team in eggs cracked (23), but the competition’s a little light, what with Casey in Seattle, and Skylar more interested in trawling Tinder than sporting for eggs. The Big Egg Hunt, sponsored by luxury jewelry company Faberge, and conceived by the The Elephant Family charity and its agency Saatchi & Saatchi (with a beacon assist from Nomi), brings over 260 large Faberge eggs designed by leading artists, designers, and architects to the most tourist-trafficked and picturesque parts of the City (i.e. not by our office). The eggs were designed by the likes of Jeff Koons, Diane von Furstenberg, Ralph Lauren, Curtis Kulig, and Zaha Hadid, and stand roughly 2.5ft tall. All of the sculptures are “hidden” in plain sight – a few are concealed indoors and some are displayed in store and gallery windows, but the vast majority are exhibited outdoors throughout the five boroughs. The Big Egg Hunt started April 1st and runs to the 26th. 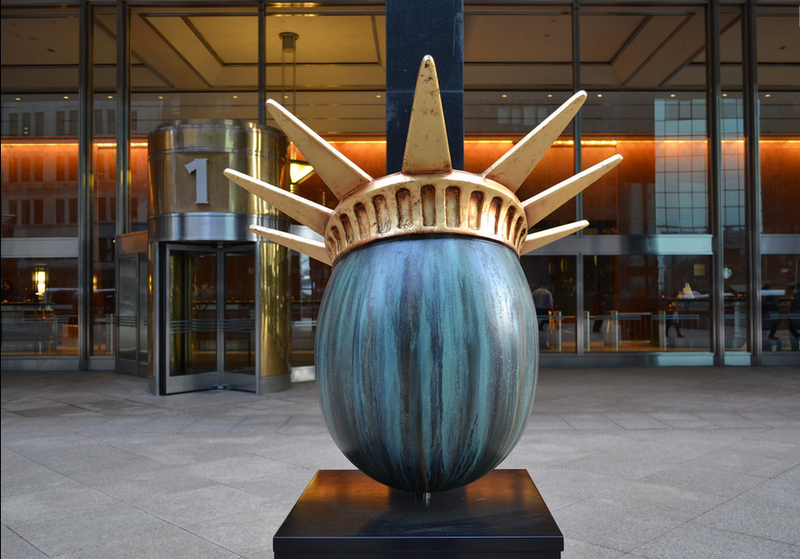 Beginning April 18th, all the eggs will be gathered at Rock Center to be auctioned by Sotheby’s and Paddle8 for charity. The idea for the hunt comes by way of London, where it was first held in 2012. The event was also staged in the U.K. cities of Glasgow, Dublin, Liverpool, and Manchester. New York’s 2014 hunt, however, is the first to come with an awesome beacon-powered, digital twist (which includes its own app, map and hashtag: #thebigegghuntny). Beacons have been placed inside every egg or pedestal (in what marks the largest beacon deployment to date, according to beacon provider Nomi). App-users receive notifications when they’re nearby a new (uncollected) egg (supposedly within 20ft). All the eggs are hidden on the map until at least 10 “egg crackers” crack them (check in), at which point the egg’s location is revealed on the map to the rest of us. The app also includes access to a sweepstakes for a chance to win over $125,000 worth of Faberge jewels. Download the free app, and register to play and enter sweeps. iPhone users can download the app here. The app is also available on Android. Remember to turn on your Bluetooth and Location Services! The beacon-enabled app pushes notifications when you’re proximate to an egg. A QR code reader within the app allows you to scan each egg’s individual QR code. The app’s leaderboard shows the top egg hunters, based on number of eggs collected, and the egg cracker honor roll celebrates the first 10 crackers per egg. The Hunt’s social channels aggregate and highlight egg check-ins and share clues to make the hunt more engaging. We could do this all day. And we’re not alone. At the time of writing this report, the Big Egg Hunt app has been downloaded 27,000 times, with over 22,000 participants registered to play (per correspondence with a rep from the event). Over 370,000 eggs have been collected so far. If all registered users participated in the hunt, that equates to roughly 18 eggs per person — a pretty impressive marker of engagement. The Big Egg Hunt is a truly exciting (egg-citing?) use case for beacons and a fun way to acclimate users to the benefits of location-tracking technology. The Hunt has validated the efficacy of deploying beacons on a large scale across a city – and established a valuable pilot for an even larger-scaled deployment, like the one we suggest to Mayor de Blasio in Beacon State of Mind: Imagining a Digital Infrastructure for NYC (in which we propose attaching a beacon to every New York streetlamp). The Hunt has also introduced beacon technology to the many architects, fashion designers and creatives who donated their work for the event – with the outcome, we hope, that many will be inspired to use the technology in the context of their own work, marketing and sales approaches. So too, the Hunt has also introduced beacons to a number of stores and galleries around the city, including at luxury retailer Saks – the event’s official retail partner – which has nine eggs hidden inside their store. The Hunt also validates an omnichannel approach to fundraising and charitable events. This mobile-first approach taken by The Elephant Family enabled much more content to be created and shared in promotion of the charity than might have otherwise been possible, and bidding directly through the app likely greatly increased the number of potential bidders. The large number of downloads for the app and registered participants also reveal some best practices in reducing friction to participation and engagement with a beacon-enabled app. The Faberge sweepstakes, gamification angle, social media integration, and tempered and context-appropriate use of push notifications all make for a super compelling and enjoyable user experience. The eye-candy appeal of the subject matter (beautifully and creatively designed eggs) doesn’t hurt either. As someone who rarely turns on location services or Bluetooth on my phone, I’ve kept both on for over a week in order to get the full Egg Hunt experience and to not miss a chance to add to my haul. I’m looking forward to doubling my collection this weekend. It’s been an exciting month in New York for fans of beacon technology, with innovative deployments featured in both the Big Egg Hunt NY as well as at the New Museum, where for the UN’s International Day for Mine Awareness and Assistance in Mine Action (April 4th) the Museum hosted an exhibit that used beacons to simulate a virtual minefield, and let the public experience the danger of landmines through the accompanying app. We look forward to innovating with the rest of the beacon community for many more creative and beneficial uses of the technology in the future. Congratulations to Saatchi & Saatchi, Nomi, and the other creative agencies that partnered on the Hunt. Hopefully many of you have been inspired to grab your smartphones, download the app, and experience an awesome use of beacon technology. How many eggs have you cracked so far? We’d love to hear from you. Let us know on Facebook or Twitter. Happy Easter, and happy hunting! The Footmarks Team.